MANILA, Philippines – The April 2018 National Police Commission (NAPOLCOM) exam results for Philippine National Police (PNP) Entrance and promotional exam are out online on July 12, 2018 or in three (3) months after the exams. View on this page the list of topnotchers or top 20 passers. The first regular exam this year was conducted on April 22, 2018 in designated schools in Metro Manila and other testing centers nationwide. NAPOLCOM said a total of 46,576 takers for PNP Entrance and promotional categories tried to hurdle the exams. 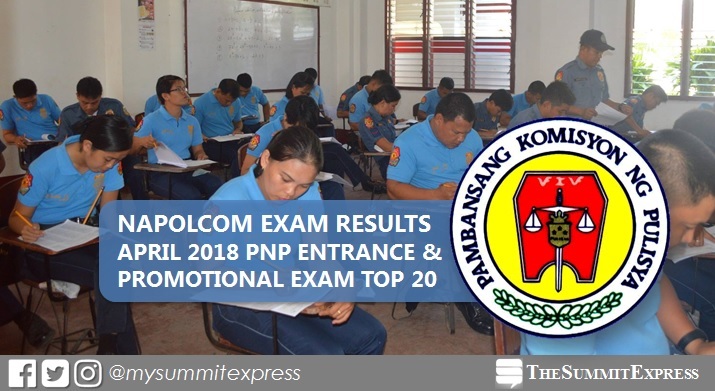 The NAPOLCOM exam covers the qualifications for Police Officer I and the promotional examinations for Police Officers 2 and 3; Senior Police Officer (for SPO1 to SPO4); Police Inspector (for Inspector and Senior Inspector); and Police Superintendent (for Chief Inspector and Superintendent). The three-hour examination for PNP entrance exam consists of objective-type and multiple choice items on general information, verbal reasoning, quantitative reasoning and logical reasoning. The promotional examinations, also in 3 hours, include general information, police administration and operations, and police customs and tradition/values and ethical standards. The Summit Express, a reliable news portal in the Philippines, will update this site immediately once results are out online. We advise takers to keep tuning in on this page. You may also visit the website of NAPOLCOM (napolcom.gov.ph) for more information.